But there’s a problem. I also fail even in this area, well, most of the time. I can’t exactly say that I am perfect in applying this principle to all people because there are just some people – you know, people who have got amazing charisma and no explanation whatsoever, I’d give my trust away in a snap of a finger – only to be disappointed in the end. As a result, it made me wallow in my own ‘negligence’ blaming myself for my stupidity until I couldn’t trust even myself. Depression would then hit me like a strong tidal wave. So I struggle. I can’t trust other people. I can’t trust even myself. I came across this bible verse several years ago. I didn’t even read it in the bible. I didn’t know it was from the bible. I was listening to the radio then suddenly a song played on and I knew from the beginning of the song that it was a Christian song because I know who the singer was. I heard this song before, but that very moment, I felt as if God was talking to me and inviting me to trust Him. 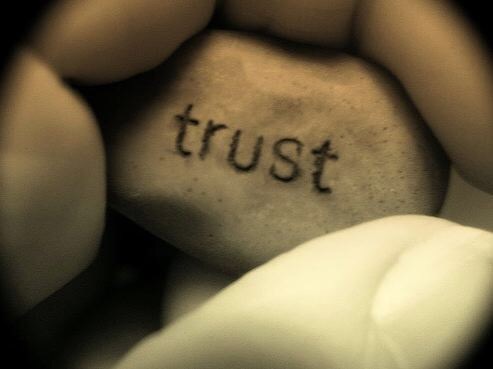 I needed someone to trust so badly with my life because I admittedly couldn’t trust anyone. The song spoke so deeply in my heart. It was like telling God exactly how I felt inside. So desperate. So hopeless. That very moment, when I didn’t even know how to utter a prayer. I prayed. Then I asked God to teach me to trust in Him and not in myself. That moment changed my life forever. And everyday I still ask God to teach me to trust in Him in everything that I do. And everyday, He walks with me to a path that leads to an everlasting life. Even when I walk astray, I can still feel His hands pulling me back to Himself. So, if you’re struggling to trust anyone, trust God. He knows your past, your present and even your future. He knows everything and He loves you!